President Donald Trump has told British Prime Minister Theresa May that he looks forward to working with her in the years to come. The White House says Trump delivered that message directly to May during a phone call Friday. Trump and the prime minister spoke a day after her Conservative Party lost its parliamentary majority in elections. Her opponents are demanding she resign, but May has told Queen Elizabeth II that she will try to form a new government. The White House says that during the call Trump also emphasized his commitment to the “special relationship” between the U.S. and the United Kingdom. May was the first foreign leader to visit Trump at the White House. The State Department says the U.S. respects the decision of British voters in their general election and looks forward to continuing to work with Prime Minister Theresa May. The department is responding to Thursday’s election which returned May’s Conservatives to power but, in a setback to her authority, without a clear parliamentary majority. She was forced into an alliance with a small party in Northern Ireland. The State Department made its comment in a statement emailed to The Associated Press. Britain’s Prime Minister Theresa May’s office says several key Cabinet members will keep their jobs following a disastrous election which left the party short of a majority in parliament. May kept in place Treasury chief Philip Hammond; Foreign Secretary Boris Johnson; Home Secretary Amber Rudd; Defense Secretary Michael Fallon; and David Davis, who is charge of negotiations to leave the European Union. Hammond in particular had been rumored for an exit in the event of victory, but the election result limited May’s options for maneuver. May plans to work with Northern Ireland’s Democratic Unionist Party to muster a voting majority. The historic English town of Canterbury, a Conservative stronghold with a high proportion of young voters, has elected a Labour lawmaker for the first time in nearly a century. Some say the result in the university town suggests that a surging youth vote has helped swing the election in Labour’s favor across Britain. Labour leader Jeremy Corbyn has appealed to young people with his promises to scrap university tuition fees and increase funding for schools and public health. The party surpassed expectations to secured 261 seats in Parliament — still way short of a majority. Government figures show that more than 2 million people aged 34 or under signed up online to vote in the month before the May 22 registration deadline — compared to 1.46 million in the same period ahead of the 2015 election. Ipsos Mori, the polling agency, says its studies showed that 55 percent of those aged 24 and under intended to vote in 2015. But this time, it was 77 percent. The EuroCitizens association in Spain, which demands continuing rights after Brexit for British citizens there and for Spanish nationals in the U.K., says the election outcome gives it hope for “a less dogmatic Brexit and a less aggressive stance by the U.K.” in the negotiations. Spanish Prime Minister Mariano Rajoy has congratulated Theresa May on collecting most votes and most seats in Parliament in Britain’s general election. Rajoy says in a message to May he wants to deepen ties with the U.K., especially their cooperation in the fight against terror attacks, and help ensure an “orderly” departure for the U.K. from the European Union. Prime Minister Theresa May has acknowledged her sadness at the loss of her majority in the general election. With 649 of 650 seats in the House of Commons declared, May’s bruised Conservatives had 318 — short of the 326 they needed for an outright majority and well down from the 330 seats they had before the vote. The European Union’s budget commissioner, Guenther Oettinger, wants Brexit talks with Britain to begin as soon as possible given that discussions over the country’s exit from the bloc should be wrapped up by the fall of next year. A day after Prime Minister Theresa May lost her majority in the general election, Oettinger came close to excluding an extension of the two year Brexit deadline, since it would bleed into the European Parliament elections of the spring of 2019. An extension would mean Britain would have to field candidates for an organization it wants to quit. “This would be a crazy game to be a candidate for a next European parliament knowing that Brexit is coming soon,” Oettinger told The Associated Press. In March, May triggered the formal two-year process by which Britain leaves the EU. The leader of Northern Ireland’s Democratic Unionist Party says it will enter discussions with Prime Minister Theresa May’s Conservatives after May lost her overall majority in the House of Commons during Thursday’s general election. Earlier, May said she is looking to form a government with the support from the DUP. Foster’s comments did not shed light on how exactly the two parties will potentially work together. German EU Commissioner Guenther Oettinger has turned the timetable screws even more on Britain, saying negotiations on its exit from the European Union must actually be finished by October next year, instead of March 2019, to allow the 27 remaining nations to approve the deal. Oettinger said that “time for Brexit negotiations is getting tight” and added that “they must be closed in October 2018″ to allow for the complicated approval process in the member states to run its course ahead of the official two-year deadline. Despite what is generally considered a humiliation, European Union President Donald Tusk took time to write British Prime Minister Theresa May to congratulate her in the wake of the elections. “I would like to congratulate you on your reappointment as Prime Minister,” Tusk wrote, but added immediately that there was much urgency to start the Brexit negotiations. “Our shared responsibility and urgent task now is to conduct the negotiations on the U.K.’s withdrawal from the European Union in the best possible spirit, securing the least disruptive outcome,” he wrote. Theresa May has confirmed she plans to stay on as Britain’s prime minister to provide certainty to the country, with support from Northern Ireland’s Democratic Unionist Party. After a brief meeting with Queen Elizabeth II at Buckingham Palace, May said Friday the new government will guide Britain’s exit talks from the European Union, which are set to begin in just 10 days. May had called Thursday’s early election to strengthen her hand in Brexit talks but instead lost the Conservatives’ overall majority in Parliament. Prime Minister Theresa May has arrived at Buckingham Palace to meet with Queen Elizabeth II and seek permission to form a new government. May’s political position has been seriously weakened after Thursday’s election, which she had called to strengthen her hand for Britain’s exit talks from the European Union. Instead, the election saw her Conservatives losing their overall majority in Parliament. May, who has resisted calls for her to resign as leader, could now seek to form a government with support from Northern Ireland’s Democratic Unionist Party. The queen does not get involved in party politics but as head of state she must give the nod to the formation of any government. The Liberal Democrats’ leader says Prime Minister Theresa May “should be ashamed” for calling a snap election and joined calls for her to resign. He said that May’s version of a ‘hard Brexit’ was rejected by the British people, and that Brexit negotiations should now be put on hold. Scottish National Party leader Nicola Sturgeon says the Conservative Party’s “reckless” approach to Brexit should be abandoned. Speaking Friday after Theresa May lost her majority in Parliament, Sturgeon said the prime minister had “lost all authority and credibility,” and should resign. Dieter Kempf, the head of the Federation of German Industries, said German industry is concerned by the election result, which saw Prime Minister Theresa May’s Conservative Party lose its majority in the House of Commons. Kempf says in a statement that negotiators cannot waste any more time, and that they effectively have only a year to agree on exit terms and transitional arrangements. Britain’s general election saw more female lawmakers elected than any before. With one seat still to be declared, 207 female lawmakers have been elected to the House of Commons — compared to 196 in the previous election in 2015. Constance Markievicz was the first woman elected to the British Parliament in 1918, following the passing of a law that allowed women to stand. She did not take her seat, however, as she was a member of Irish party Sinn Fein. Sinn Fein has historically not sat in the British Parliament. In Thursday’s election, Sinn Fein won seven seats in Northern Ireland. Underscoring the frustration on the British foot-dragging over the start of Brexit talks, EU Commission President Jean-Claude Juncker has a perfect time in mind: tomorrow morning. Though the British election result, which saw Prime Minister Theresa May’s Conservative Party lose its majority in the House of Commons, has thrown another complication into the start of the talks over Britain’s exit from the EU, Juncker said the Commission is ready to start. The German government says it hopes that Brexit talks will start soon and is noting that European Union members would have to agree unanimously to extend the two-year deadline for negotiations. Demmer added: “We hope that the negotiations can begin quickly, because the two-year deadline is already running and it could only be extended unanimously.” She didn’t say what Germany’s position would be on an extension. British Prime Minister Theresa May formally notified the EU of Britain’s intention to leave at the end of March, setting off the countdown to Brexit. The Czech prime minister says Britain should not be granted any extension on the two-year timetable for the Brexit talks, despite likely difficulties in getting the negotiations started following Thursday’s general election which saw the Conservative Party lose its majority. Czech Prime Minister Bohuslav Sobotka said in Prague that too much time had already been wasted since the June 23, 2016 British referendum to leave the European Union. British Prime Minister Theresa May formally launched the two-year Brexit timetable in March, before calling the early election in hopes of increasing her majority ahead of the formal start of Brexit talks. The deadline can in theory be extended if all sides agree. A unionist party in Northern Ireland that appears to be Prime Minister Theresa May’s best bet to form a new government has said it’s too soon to talk about what will happen. May’s Conservative Party lost its overall majority in Parliament in Thursday’s election. Her best prospect for forming a new government appears to be an arrangement with the DUP, which won 10 seats. May had called the early election in hopes of getting a bigger majority to strengthen her hand in discussions with the European Union over the country’s exit from the bloc. EU foreign policy chief Federica Mogherini has voiced her frustration about the lack of clarity regarding Britain’s exit from the European Union, a year after the country voted for Brexit. In contrast, she said the 27 remaining EU nations have long worked out a detailed negotiating stance for talks they would have hoped to start on June 19. With Thursday’s election result, the picture has become more muddled. Jeremy Corbyn did better than expected in the British parliamentary election, but his skill at giving celebratory “high fives” needs a bit of work. The Labour Party leader tried to high five adviser Emily Thornberry to mark her election victory, but he completely missed her hand — and his hand landed directly on her chest. Video of the slightly awkward moment was popular on social media Friday. Thornberry serves as a senior adviser on foreign affairs. She easily won election in a London constituency. The leader of the U.K. Independence Party has stepped down after the right-wing party failed to gain a single seat in Britain’s general election. UKIP, which is strongly anti-European Union and anti-immigration, had enjoyed a surge in support in the 2015 general election. But on Thursday the party lost its only seat in Parliament, and Nuttall came third behind the Conservatives and Labour in his constituency. Germany’s foreign minister says he hopes the outcome of the British election will be seen as a message that the British people aren’t looking for a so-called “hard exit” from the European Union. May had called the election in hopes of getting a mandate to pursue her strategy for Brexit. She had made clear that she was prioritizing controls on immigration for those negotiations, stoking worries that Britain would end up with a “hard Brexit” that would have seen tariffs slapped on British exports to the EU. Prime Minister Theresa May plans to seek the permission of Queen Elizabeth II to form a government even though her Conservative Party lost its majority in the House of Commons. Downing Street says she plans to meet the queen at 12:30 p.m. local time (1130 GMT). May will need the support of another party or group of parties to command a majority. Her plan of calling an early election in the hopes of getting a bigger majority than she enjoyed during the previous parliament backfired in Thursday’s general election. EU Council President Donald Tusk says that Britain should look to start discussions to leave the European Union as soon as possible or it risks crashing out of the bloc with no deal. “We don’t know when Brexit talks start. We know when they must end,” referring to the March 2019 deadline. 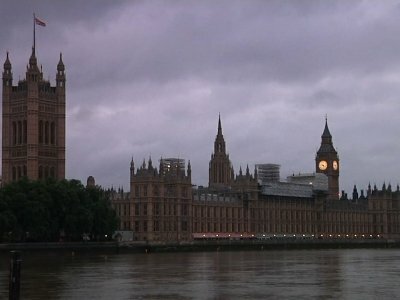 Britain triggered the two-year negotiations on March 29. The European Union has long said it’s ready to start discussions over Britain’s exit from the EU. May formally triggered the two-year Brexit departure timetable in March. The first face-to-face discussions between the British government and EU officials were due later this month. Last year, then Conservative prime minister, David Cameron, called the Brexit referendum last year with the aim of staying in. This year, Theresa May called the early election in hopes of increasing her majority ahead of discussions over the country’s exit from the EU. Verhofstadt said he hoped Britain would soon have a “stable government to start negotiations,” which are important for the future of Europe too. The pound has fallen further after British election results showed the Conservative party lost its majority. The British currency lost as much as 3 cents against the dollar late Thursday and early Friday, to fall as low as $1.2636 in Asian trading hours after the final results started trickling in. It recovered somewhat to trade at $1.2677 but remained well short of the $1.2955 level before the exit poll was published late Thursday. With most seats counted, it’s become clear the Conservatives are unable to win the 326 seats needed for an outright majority. Investors worry a minority Conservative government would be weaker in Brexit talks, scheduled to begin June 19. Labour Party leader Jeremy Corbyn says he is “ready to serve” the country while ruling out potential deals or pacts with other parties in Parliament. Speaking after a successful election for Labour which saw Prime Minister Theresa May lose her majority in the House of Commons, Corbyn said people have had enough of austerity politics and cuts in public expenditures. He repeated calls for May to resign. May had called the early election in hopes of increasing her majority. Instead, her Conservative Party lost its majority and Labour claimed a haul of seats. Corbyn also says that upcoming discussions over Britain’s exit from the EU have to continue regardless of which party forms the next government. The European Union’s budget commissioner Guenther Oettinger says the outcome of the British election calls into question whether Brexit negotiations will be able to start as planned and will certainly complicate the process. Speaking Friday morning by phone on Germany’s Deutschlandfunk radio, Oettinger said the EU is prepared to stick to the negotiation timetable but that it would take a few hours at least to see how the results of the election play out in the formation of a government. He says the election was not a referendum on Brexit and that he fully expected the process to continue, but that results could make negotiations more difficult. France’s prime minister says he doesn’t believe the surprise British election result means the country has changed its mind over its decision to leave the European Union. Speaking Friday on Europe 1 radio, Edouard Philippe conceded that “the tone” of Brexit negotiations may be affected by British Prime Minister Theresa May’s failure to secure a parliamentary majority. Discussions between the British government and the EU are formally set to begin later this month. Britain’s news media says Theresa May has no intention of giving up the post of prime minister even though her Conservative Party lost its majority in the House of Commons in Thursday’s general election. Mays’ future as leader and head of the Conservative Party is being openly questioned after her call to hold a snap election backfired. May called the election in hopes of increasing her majority in order to give her a stronger hand in negotiations with the European Union over Britain’s exit. However, with nearly all votes counted, the Conservatives are on 315 seats, short of the 326 mark that ensures a majority. The Labour Party, led by Jeremy Corbyn, did much better than most forecasters predicted, and has 261 seats at last count. British media are reporting that Conservatives can no longer win an outright majority in Parliament. Sky News reported early Friday that Labour held the seat of Southampton Test, guaranteeing that no party will reach the 326 seats necessary for an overall majority in the 650-seat Parliament. The result will heap pressure on Prime Minister Theresa May to resign, after she called a snap election in the hope of increasing the Conservative majority in Parliament to strengthen her position in Brexit negotiations. Britain’s home secretary has narrowly avoided defeat in the general election, holding on to her seat in Parliament by 346 votes after a recount. In the 2015 election, Amber Rudd won the Hastings and Rye seat in southern England by almost 5,000 votes. But the governing Conservative Party has suffered big losses in the election and is on the verge of losing its parliamentary majority. Several government ministers have lost their seats. The result will heap pressure on Prime Minister Theresa May to resign, and many consider Rudd a potential Conservative leader. She is regarded as having performed well during the campaign, which was marred by deadly attacks in Manchester and London. As home secretary, Rudd is in charge of the police and security services and helped lead the response to the attacks.